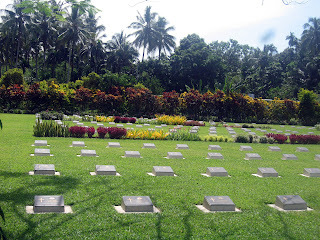 I visited Bitapaka War Cemetery, not far from Rabaul, East New Britain province, recently. This peaceful and beautiful cemetery contains the graves of over 1, 000 Allied war dead and the Rabaul Memorial commemorates those who have no known grave. The cemetery is maintained by the Office of Australian War Graves, Department of Veterans' Affairs, on behalf of the Commonwealth War Graves Commission. It is located near the site of the first Australian action of World War I when the Australian Naval & Military Expeditionary Force (AN&MEF) captured a German wireless station on September 11, 1914. Each grave is marked by a bronze plaque set on a low concrete pedestal with 500 marked 'Known to God'. As well as Australians, the cemetery contains the graves of Indian and British prisoners of war who were transported to New Britain by the Japanese as a labour force. The peace of the setting and the enormous number of white crosses shocked me with the contrast. It was here that I began to grasp the sacrifice made by those who give their lives for their country. Bitapaka War Cemetery respects and honors those who made the supreme sacrifice for their people. Bitapaka – like other war cemeteries in Papua New Guinea – offers an opportunity to create goodwill amongst all the living so that the same tragedies may not be repeated. Bitapaka is a village in East New Britain which, in 1914, was the site of a German radio station and thus a target for the troops of the AN&MEF. After landing at Kabakaul on the morning of September 11, 1914, troops from the AN&MEF were involved in a series of skirmishes with German forces, mostly local Melanesian troops, along the track to Bitapaka. The radio station was finally secured at 7pm at a cost of seven Australians killed and five wounded. One German and 30 Melanesians had died in the effort to defend it. Bitapaka War Cemetery contains 1, 111 burials of WW11: 12 from the Navy, 1,042 from the Navy, 55 from the Air Force and two civilians. Of these, 35 are British, 420 are Australians, one is a New Zealander, 614 are Indians, 34 are Fijians, two are Western Solomon Islanders, and five are Allies. The memorial commemorates 1,113 Australian soldiers, 104 airmen and eight Papua New Guineans who have no known grave. The Indian soldiers were prisoners of war from the Malayan Campaign, while the remainder of the burials and all the names on the memorial are of men who died in New Britain and New Ireland. The cemetery also contains 28 burials of WW1: 27 Australian and one British. The cemetery and memorial were constructed and are maintained by the Commonwealth War Graves Commission. Your pig or your life? Are we blind to the genocide of West Papuans? A message for Anzac Day- Lest We Forget!